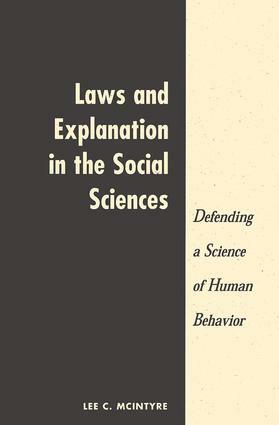 The first full-length defense of social scientific laws to appear in the last twenty years, this book upholds the prospect of the nomological explanation of human behavior against those who maintain that this approach is impossible, impractical, or irrelevant. By pursuing an analogy with the natural sciences, McIntyre shows that the barriers to nomological inquiry within the social sciences are not generated by factors unique to social inquiry, but arise from a largely common set of problems that face any scientific endeavor.All of the most widely supported arguments against social scientific laws have failed largely due to adherence to a highly idealized conception of nomologicality (allegedly drawn from the natural sciences themselves) and the limited doctrine of ?descriptivism.? Basing his arguments upon a more realistic view of scientific theorizing that emphasizes the pivotal role of ?redescription? in aiding the search for scientific laws, McIntyre is optimistic about attaining useful law-like explanations of human behavior.